Formerly known as Women in Work, Works for Us has a rich history in supporting local women in to employment and training. We are hoping to continue our success in serving the local community, having celebrated 40 years of service last year. Located in the iconic Point building in central Milton Keynes, we provide local men and women with free careers advice, training and support. With gender equality a key business issue, Works for Us continues to play a pivotal role in helping local women return to work after taking a career break. Mark’s visit gave us the opportunity to share our ambitious plans for the future, alongside a discussion of how the lack of flexible working opportunities in Milton Keynes is impacting upon local employment opportunities. A big thank you to Mark for taking the time to visit us. On Monday 17th December, we held this year's AGM meeting at our headquarters in The Point, CMK. We also used the opportunity to hold an official celebration for the charity turning 40 years old. ​Please find a copy of the Works for Us 2018 AGM Report below. Works for Us runs the NSPCC Half Marathon! ​ We would like to say a big congratulations to our Strategic Manager Marion, our IAG Service Manager Kelly & long-term supporter Pete who ran the NSPCC Half Marathon this weekend to raise valuable funds for Works for Us as part of our continued 40th birthday celebrations! As a local, independent charity, we rely on the kindness of our supporters and fundraisers to continue the work we do. If you'd like to support their efforts, you can donate here. Are you a budding entrepreneur? Or would you simply like to understand the power of the mind, set achievable goals, & gain an entry level qualification when you finish? We are pleased to announce that as of October we are running a new 2-day intensive course called Developing Enterprise Skills. The first course will run from October 10th - 11th and at the end of the course you will obtain an entry level qualification. For further information or to secure a place, contact us. Please note: certain eligibility criteria apply and clients must be registered with the service before accessing the course. Works for Us had the opportunity to celebrate its 40th birthday in style this weekend by exhibiting at Intu Milton Keynes. Paying homage to 40 years of supporting Milton Keynes residents into work, training and volunteering, we were on the mall on Saturday 1st & Sunday 2nd promoting our services, with information available on how we support clients and how individuals or corporations can support us. ​The event was a great success, so we'd like to say a big thanks to Intu Milton Keynes for the opportunity! And if you know someone that might benefit from our services, please pass our details along. If you would like to continue to receive information on the latest courses, services and opportunities available at Works For Us, please submit your details here. We are now recruiting for a number of voluntary roles to help support the charity during its continued growth and success. We would like to welcome on board Natasha Evans who joins us from the YourMK Job Clubs. Natasha is replacing Simone Molloy as our Supported Volunteering Project Coordinator. Anyone interested in volunteering opportunities can contact Natasha. On February 1st, the Mayor and Mayoress of Milton Keynes formally opened an exhibition of work by clients and associates of local charity Works for Us, at the Cornerstone Gallery in the Upper Cloisters of Christ the Cornerstone, Saxon Gate, Central Milton Keynes. The exhibition kickstarts a year of celebration for Works for Us, which was established in Milton Keynes 40 years ago as MK Women and Work. As a charity we aim to empower people to transform their lives by offering them free access to personalised advice and support, including workshops and courses designed to build skills and self-esteem. Much of the work on show at the Cornerstone was completed during Works for Us Confidence through Art sessions, where clients are encouraged to engage or reawaken their creativity to strengthen mental health and develop resilience to weather challenges in their lives. "Firstly I wish to say Happy 40th Birthday to Works for Us and to thank you for the contribution Works for Us (formerly Women and Work) has delivered to the Community of Milton Keynes. It is amazing to have survived this length of time and continued to provide such a valuable service. I wish you continued success for the next 40 years and look forward to seeing Works for Us delivering the variety of provision which meets the needs of our diverse and expanding population. The exhibition continued to February 14th and was open to the public seven days a week during Christ the Cornerstone's opening hours. 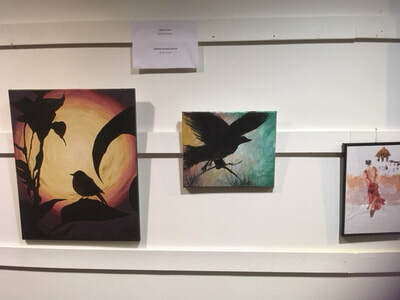 Some of the work displayed is available for sale to help raise much needed funding for the charity. Please contact Marion Cole for more information. Please click here to a review of our annual report, presented by our Chair of Trustees, Alexa Wilkinson MBE. The Works for Us AGM will be held on the 22nd of January 4-6pm. Today we started our move across to The Point. A big thank you to everyone who has helped out. Take a look at some of the great art created in our Confidence through Art classes. We have uploaded some new pictures and will continue to share the amazing art that is created here. Interested in being a part of this incredible group? Contact us on 01908 200186. Works for Us will be moving to The Point, 602 Midsummer Boulevard, Central Milton Keynes, MK9 3NB (Main entrance near Gala Bingo) on Thursday 30th November. Our phone line and internet may not be working straight away so if you want to contact us please call 07852 963744. Courses will be starting again in January. If you are interested or require any information please ring 07852 963744 for more details or to register. Win a car for £1! Win a car for a £1! We are really pleased to be involved with the Milton Keynes Community Foundation’s Community Car Raffle this year. 50% of the money we raise from selling tickets will go towards our fundraising and the remaining funds go towards MKCF’s grant making programme. ​Please buy some tickets when you are next in our office. Works For Us currently have a vacancy for a project co-ordinator. The coordinator will identify and source relevant volunteering opportunities based upon our client’s needs and preferences for improving and developing their workplace skills. If you are interested in this role please download the Job description and application form from our Jobs Page and return to: m.cole@worksforus.org.uk by 5.00pm on Friday 27th October 2017. We are delighted to announce that Citizens Advice will now be running a drop-in service at Works for Us starting on the 18th October. A CAB adviser will be here every Wednesday between 1.00-3.00pm to deal with your enquiries and offer advice. Network Rail are hosting a "return to work open morning" on Wednesday 4th October at the Quadrant:MK. The aim of this event is to provide an opportunity for professional engineers in a ‘return to work’ circumstance to learn more about Network Rail, benefit from networking with some of our engineers and gain tips about the recruitment process. Take a look at the information provided and see if this is of interest to you! We are looking to create an amazing piece of art and we need your inspiration! We just wanted to say a quick thank you to all of our followers on Twitter. We finally made it to 100 followers. If you don't already, you can follow us here @MKWorksforUs. She wil be offering one to one support with careers guidance, CV writing, help with job applications and will help with interview skills, alongside Kelly, our information, advice and guidance worker. ​A massive thank you to Simone Molloy for everything she has done for us in her time here! ​Simone has moved to Ireland and will no longer be working here. Simone was a massive part of the team here as the Volunteer Project Manager here. She will be greatly missed by all. Everyone here at Works for Us would once again like to say thank you for all of your hard work and we all wish Simone the best for the future. Thank You! We've been talking to Red Thread Partnership Ltd about their Fellowship Programme. We can now announce the exciting news that we will be working with three of their Fellows to develop our Working Wardrobe. So watch this space, there's going to be some big changes within that part of our charity! ​Earlier today we hosted our very own open morning. This event was arranged to showcase what it is that we do here and how we help. Take a look at some of the pictures from the event in our gallery here. Congratulations to Sam Forrester who has moved on to a new role at the Neighbourhood Employment Programme working alongside the Children Centres. Sam was a valued member of our team as the IAG Service Manager. She will be missed by all here at Works for Us. Thank You Sam! A massive thank you to one of our trustees Elizabeth Sheldon. Elizabeth very kindly donated her office furniture to us when her company recently moved premises. The furniture will be used to make our office a more comfortable and welcoming place for all. ​Thanks again Elizabeth, we appreciate everything you do for us. A big thanks to Co-Op and our supporters! Thanks to the Local Community Fund, run by Co-Op, we have been awarded £2,197.94! Thank you to everyone who has chosen us as their registered charity and continue to support us. We'll be using this money to update our IT equipment and software, plus our phone system. Works For Us Win at MK Soup! ​Works for Us were pitching at the MK Soup last Friday... and won the funding collected on the evening...it was a 'full house', so won just under £400 to support their Working Wardrobe project. Big congratulations to our 2016 Women Leaders’ Winner, Elizabeth Sheldon! Women Leaders MK is a prestigious awards event that recognises the talents and achievements of women living or working in the Milton Keynes postcode area. Friday October 21st saw the second Women Leader’s awards event take place at the Hilton DoubleTree, MK Stadium with over 500 guests cheering our finalists and winners throughout an inspiring and fun-filled evening. Congratulations To our volunteers who have now found paid employment! 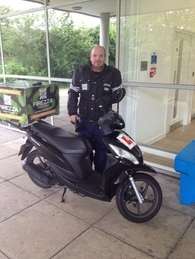 Congratulations to Roger Tucker who has found work as a local Pizza Delivery Driver! Roger has been attending Works For Us for the last year starting as a client attending courses, before becoming a volunteer. We wish him all the best in his new role! Also Congratulations to Simone Molloy who has been appointed our volunteer co-ordinator! Simone has also been attending Works For Us for some time and has been a valuable member of the team. Simone has recently completed her Award in Education qualification and has been facilitating our computer courses. We look forward to working with her on the volunteer project! Dress a Child in Need Project - Sew & Sew Group and Friends! What a buzz there was in the Works For Us office on Wednesday 28th June 2016 with the Sew & Sews group and a few friends making dresses and shorts for the Dress a Child in Need project! The group were very busy bees cutting, stitching, ironing all these lovely garments which will soon be on their way across the world to some children who are desperate for them! Well Done to all involved!! More happy times at ‘Works for Us’ this week, as staff, volunteers, trustees, clients and partners all came together to share a nice cup of tea and enjoy cakes made by those attending in honour of their retiring manager, Janice Jones. Janice who had been with the charity for 14 years said of it: "My time at Works for Us has been both varied and incredibly rewarding. I'll really miss the clients, volunteers, trustees and staff who are so supportive of each other. I will be keeping in touch!" ​Representing Works for Us,Trustee Chris Parsons and Manager Janice Jones ready to leave for MK CAB's visit by their Patron, Her Royal Highness Princess Anne.